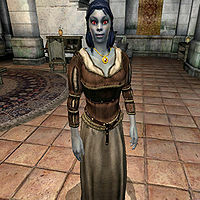 Dralora Athram, a Dunmer commoner, lives in the Imperial City's Talos Plaza District and is the wife of Ulen Athram. She does not seem to share his hobby, though. Even though her husband's dark secret is more than likely to make her a widow in time, Dralora takes it easy in life. As a matter of fact, the couple really doesn't spend much time together as Dralora goes to bed when Ulen gets up at 6am. She will sleep until midday and will then spend all day and night wandering around the ground floor of their luxury house. Every day, at 2pm, she will exit the house for her daily trip around town to various destinations: On Morndas and Fridas, she will take a three hour stroll around the Arboretum. On Tirdas and Turdas, she will walk casually around in the Talos District until 8pm and on Middas, she will pray for four hours at the Temple of the One. On Loredas and Sundas she can be found betting in the Arena for five hours. On the 29th of each month, she will exit the house at midnight and start her long trip to Leyawiin; She heads south on the Red Ring Road and follows it until she reaches Pell's Gate, then heads south on the Green Road. She will keep walking this road all the way to Leyawiin, on the way passing the city of Bravil. This long trip takes her a whopping twenty four hours and she usually reaches her destination just before 1am on the following day. Once there, she will hit the Three Sisters' Inn and spend two days there, relaxing with the regulars. On the third day, at midnight, she'll leave the Inn and take the long trip back to the Imperial City and her usual routines. Compared to her husband, her choice in clothing is more common and middle class: a brown shirt, a pair of light brown linens, and quilted shoes. She carries around the key to the house, some gold, and the rare amulet of luck, which she claims helps her when betting at the Arena: "You like my amulet? It's enchanted, makes me lucky! I swear it helps me win these matches!" When approached she will give you some background information on her and Ulen: "Dralora Athram. I came here with Ulen fifteen years ago. Best thing we ever did." On the Imperial City, she will tell you about her former home: "Morrowind is still living in the Second Era. I can't believe how they treat Khajiit and Argonians. Here, we are Imperial citizens, nothing less."